Transfer from the airport to the hotel. In the early afternoon (pending the arrival of flights) proceed from the hotel on a brief walking tour in the Jewish Quarter of of Budapest, including a visit to Kazinczy Rumb and Dohany synagogues, and learn about the types of Judaism practiced in Budapest : Orthodox, Status Quo, and Neolog. We are tentatively scheduled to receive a private tour of the Dohany by the synagogue's rabbi and an exclusive visit to the Rabbinical Seminary of Budapest, which was the only rabbinical seminary permitted behind the Iron Curtain. Hotel Continental Zara. Breakfast. In the morning we will attend services at the at the Shas Hevra synagogue . Lunch. Following our meal, we will meet with one of the rabbis of Budapest , who will speak to us about Jewish life in the city. Later in the day we will have a light walking tour in the city. Seudah Shlishit will serve as dinner this day. Hotel Continental Zara. Breakfast. In the morning, we will visit the Hungarian Jewish Museum, the actual birthplace site of Theodore Herzl. From here continue to the Kosma cemetery, one of the most incredible Jewish sights in Budapest . Here we will see the "houses" of the wealthy Budapest families, and visit the graves of some important rabbis, including that of R. Shimon Oppenheimer, famous for proclaiming that the prayers of visitors to his grave will be heard in heaven. Following the cemetery tour, we will visit the moving Holocaust Boots memorial on the Danube and Budapest 's Freedom Statue. After Lunch, we continue by coach to the Castle area in Buda, offering panoramic views of the city and the Danube River below. In the Buda area of the city, we will also see the synagogue that was used during Turkish rule and stand over the historic synagogue that remains underground. By scenic roads, we will return to the Pest part of the city, returning to the hotel in the afternoon with time to rest. In the evening, enjoy a simple Dinner followed by a cruise on the Danube . Hotel Continental Zara. Breakfast. Check out of the hotel. Next, travel to Eisenstadt, home to many great Torah scholars. We will visit the Jewish cemetery (where R. Meir Eisenstadt's grave is a pilgrimage spot), the old synagogue, and the museum established by the Austrian government to teach young Austrians about Jewish history. While in Eisenstadt, we will learn about R. Esriel Hildesheimer, who established the first yeshiva to include both Torah and secular studies in its curriculum. Lunch boxes will be provided. From there, we head to Sopron , known to Jewish history as Oedenburg, and one of earliest recorded places of Jewish life in Hungary . We will wander through the streets of the old Jewish ghetto until arriving at the medieval synagogue and recently erected Holocaust memorial. Later, drive though serene countyside to Bratislava . Upon arrival, visit the local Holocaust memorial, the grave of Hatam Sofer and the newer cemetery, where many other Torah sages are buried.. 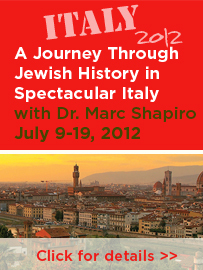 Following Dinner, Dr. Shapiro will speak about the life and significance of the Hatam Sofer. Radisson Blue Hotel. Breakfast. Depart for Vienna . Upon arrival, begin a tour with focus on the Jewish aspects of the city, including the Stadttempel, the ruins of the Medieval synagogue on Judenplatz and the Jewish cemetery (site of the grave of the "holy fish"). After Lunch, tour the majestic city, including the famous Ring Road and magnificent Schonbrunn Palace . After some free time, return to Bratislava in the late afternoon. Following Dinner, R. Baruch Myers, the rabbi of Bratislava , will speak to us about Jewish life in Slovakia . Radisson Blue Hotel. Breakfast. Check out of the hotel. Depart for the Czech Republic and its colorful town of Mikulov , which is known in Jewish history as Nikolsburg. This was the site of the Moravian Chief Rabbi, and many great scholars, including the Maharal and R. Samson Raphael Hirsch, lived here. The cemetery has 4,000 tombstones, and we will learn about some of the important figures buried there, including R. Mordechai Benet. Lunch boxes are provided this day. We will see the old mikvah (recently discovered), and lunch in what used to be a synagogue on the old Jewish street, whose houses are architecturally significant. Continue to Boskovice to visit the magnificent synagogue, and then journey to Prague . Check in at the hotel, followed by Dinner and Mincha/Maariv at the Altneuschul, the world's oldest functinioning synagogue. Hote l Intercontinental or President. Breakfast. The entire day is devoted to seeing the Jewish sights of Prague . We begin in Josefov, the old Jewish Quarter, where we will visit the Maiselova, Klaus, Pinchas and Spanish synagogues. These synagogues (combined) house the Jewish Museum, which has many wonderful exhibits. We will tour the old Jewish cemetery and learn about the many great figures buried there, including the Maharal. The highlight of our visit to the Jewish quarter is the Altneuschul, where, according to legend, the Golem is to be found in the attic. After Lunch, continue to the Prague castle area to enjoy the stunning view of the city and its many spires below. Before Dinner, enjoy some free time for shopping and independent exploration. Hotel Intercontinental or President. Breakfast. Visit the cemetery of the Noda bi-Yehudah, the famed R. Yechezkel Landau. After hearing about this great figure, and the others buried in the cemetery, and seeing what became of the cemetery under Communist rule, we depart for Terezin (Theriesenstadt) for an insight to the horrors of the Holocaust. Lunch boxes are provided this day. Return to Prague in the late afternoon. In the evening, we will attend services at the Altneuschul, followed by Shabbat Dinner. Hotel Intercontinental or President. Breakfast. In the morning, we will attend services at the remarkable Jubilee Synagogue, the largest synagogue in Prague . After lunch, there will be a light walking tour of Prague , in which we will stroll along the Charles Bridge . Here we will see the famous Crucifix with Hebrew writing, and hear the amazing story of its origin. We will also visit the striking statue of the Maharal, proudly standing outside Town Hall. In the late afternoon, we will walk to the Community Center, where Dr. Shapiro will lead a class on one of R. Ezekiel Landau's responsa, and provide a follow-up on the life of R. Samson Raphael Hirsch. Seudah Shlishit is served at the Community Center (serving as Dinner). Hotel Intercontinental or President. Breakfast. Transfer to the airport for the return flights to Canada or the USA . As we explore the Jewish Quarter, we will visit old synagogues including the famed Dohany synagogue, as well as the Jewish museum. Dr. Shapiro will tell us about the history of the Reform movement in Hungary and the great schism that took place between Orthodox and Reform. Learn also about the so-called "Status Quo" rabbis-including some great Torah scholars-who refused to join with the Orthodox. Visit the grave of R. Shimon Oppenheimer, famous for proclaiming that the prayers of visitors to his grave will be heard in heaven. Also visit the grave of R. Moses Kunitz and hear about this incredible figure. Visit the Rabbinical Seminary of Budapest, founded in the nineteenth century. This was the only rabbinical seminary permitted behind the Iron Curtain. On Shabbat, we will be joined by leaders of the Budapest Jewish community, who will speak to us about Jewish life in Hungary. We will visit the beautiful town of Sopron, known to Jewish history as Oedenburg and one of earliest recorded places of Jewish life in Hungary. We will wander through the streets of the old Jewish ghetto and see the medieval synagogue and mikvah. Eisenstadt was home to many great Torah scholars. We will visit the Jewish cemetery (where R. Meir Eisenstadt's grave is a pilgrimage spot), the old synagogue, and the museum established by the Austrian government to teach young Austrians about Jewish history. Dr. Shapiro will tell us about R. Esriel Hildesheimer, who established in Eisenstadt the first yeshiva to include as part of the curriculum both Torah and secular studies. Bratislava is known to Jews as Pressburg and was the home of the famed Hatam Sofer and the Pressburg Yeshiva. The Hatam Sofer is arguably the most important Torah sage of the last two centuries, and Dr. Shapiro will speak about this amazing figure and the rabbinic dynasty he founded. We will visit the graves of Hatam Sofer and other gedolei Yisrael. For dinner in Bratislava we will be joined by R. Baruch Myers, who has been the rav of the city since 1993. He will speak to us about Jewish life in post-communist Slovakia. Visit the Habsburgs' magnificent Schonbrunn Palace, drive along the famous Vienna Ring Boulevard, tour the Stadttempel and Jewish Museum, and at the Jewish cemetery see, and learn about, the grave of the "holy fish". Many great Torah scholars lived in Nikolsburg, including R. Samson Raphael Hirsch. The cemetery has 4,000 tombstones, and Dr. Shapiro will speak about some of the important figures buried there. We will see the old mikvah recently discovered, and have lunch in what used to be a synagogue on the old Jewish street. On the way to Prague, we will stop in the medieval city of Boskovice, where you can still see the old ghetto gate. We will visit the cemetery and amazing synagogue and learn about Jewish history in this part of the Czech Republic. In the magnificent city of Prague we will visit all the important Jewish sites, such as the Altneuschul and other synagogues, the important cemeteries which contain the graves of the Maharal, R. Yehezkel Landau (Noda bi-Yehudah) and many other greats. We will also visit Theriesenstadt, Prague castle, and walk on the Charles Bridge. On the Bridge we will see the famous 17th century crucifix with Hebrew writing. Only in recent years have we learned the origin of this strange site. Over Shabbat we will learn about the many greats who have lived in this city and hear about the most mysterious inhabitant of all, the Golem. This is only a general overview of the places of interest that we will visit on our tour. More detailed information will soon be added. In addition to the obvious Jewish significance of our stops, there is a good deal of more general interest to be experienced; and the smaller places are quite picturesque.